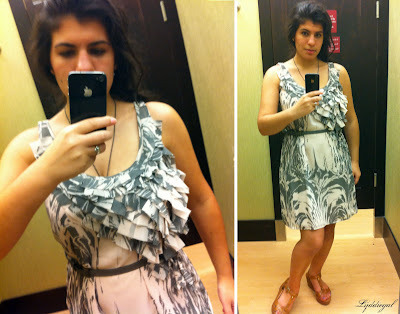 Has this blog made me into a shopaholic? I was once a girl who rarely loosened her purse strings. I was also once a girl who wore over-sized denim overalls, so there was certainly less desire for the pursuit and purchase of cute things. I'm not blaming the blog exclusively, but there is certainly a problem when I'm constantly viewing new fashions and being influenced AND given a link. One click and it's mine. Plus it's on sale. That's what I'm all about right, getting a good deal? And I have so much trouble letting go. I've occasionally watched the shows about people who have too much stuff. And they get so damn emotional about it, like they would cease to exist if you took away one of their seven tea kettles. There is so much talk on blogs about the fast fashion industry and the consumerist society. I can't help but to think about it. Think about the people we idolize. People with huge homes, closets bigger than most people's apartments, filled with stuff they are only going to wear once and then forget about. Here I am, a cog in the consumerist machine, lusting and waiting for that sale, and buying and feeling victorious! I got the discount, I have won. And I have so many moments when I can't help but think, "So what, I bought something - big deal! I earned money to spend money, and this makes me happy." I buy clothes for a life I wish I had. One where I've got a sweetie to take me out to dinner, one with fabulous parties to attend, one with afternoons on sail boats, or weekends in the Hamptons. I'm sorry this isn't really going anywhere. I just wanted to get these thoughts out. I wonder if stopped shopping how I would feel. Better, worse, or simply the same? Could I even do it? Lately it seems I can barely go a few days. My shopping habits have been growing, I've done nothing else this summer. Every weekend, shopping is my only activity. I think it was this dress that brought on all these thoughts. Cute, no? It was on sale, for $30 and I bought it (along with $38 of other stuff) and thought "Where will I wear this?" And thought about all the other clothes that I've loved, and bought, and have no where to wear. And I wonder if this makes me a bad person. And now I'm staring down my shopping cart at Urban Outfitters and wondering what I should do. Be the shopaholic, or not? Thanks for reading, and as always, for your thoughts. PPS. I know I've passed 200 followers, giveaway tomorrow!! I understand completely!! Especially the where to wear things part. I've acually been thinking about organising a 'dress up' night. Where a group of us go to dinner, lunch or breakfast. Whenever people are free and we can all dress up. My work schedual usually takes up my weekends and some of my clothes are just too nice for uni.Maybe you could do something like that? Then you could at least get some wear out of some outfits. As for the whole shopping addict. Let me know when you figure out the answer for that!! I am finding that doing challenges like the 30 for 30 make me more conscious of the clothes I already have in my closet. Maybe doing something like that can help. I find that saying NO shopping whatsover can back fire so maybe setting a limit or something. By the way, your a beautiful girl, that someone special will come don't worry, you are young and beautiful and smart. Wish you the best. Lyddie, I do think we need to spill out our thoughts more on our blog. It feels so good, and I think so many people can relate. I can definitely relate to what you have to say here.. for some reason, even though I buy all these things, all these good deals, all these new shiny things that I feel are going tor be versatile pieces, I still sort of feel unsatisfied. It's like I get inspired and think, "Oh, I'd need this too.. it would go with so much." I feel super guilty that I haven't worn lots of my new things, although I have been saving them for school, but at the same time some dresses and skirts are short and purely meant for out of school wear. After about spending 100 bucks on my last shopping trip, I think now that I need to buy more things with color, and I wish I could just stop that and be happy with what I have! I have this closet with amazing things inside of it, and people walk in it and tell me it's like walking into a mini mall. I think from now on I just need to buy things that I have actually wanted and like myself, rather than getting it because it's in or just to buy something. Sometimes, even when I'm taking my outfit pictures, I'll take off what I wear and put on an old skirt and tee shirt just because I feel bad about ruining it's "newness." I have this weird thing where I can't wear new clothes for like a week.. and it seems by then I forget about it, or feel bad about not wearing it, but fear that if I wear it that it'll get worn out. I have so many weird habits. WOW look at what I typed. Good post you did, Lyddielove. :D You have inspired me to see what I can dig up in my closet.. I know sometimes reorganizing a closet can inspire new outfits and help rediscover the lost? Maybe that's all we need! We have all this cute stuff, we just need to do something with it now instead of letting it sit there all pretty like. Oh do I feel your pain. Story of my life. When I start to feel like this, I forcefully put myself on a shopping ban for at least a month, 2 months would be ideal. I did last fall and it was great for my wallet as well as my view on shopping. YES! I've been thinking about the same thing lately. Reading fashion blogs makes me feel like I'm not stylish enough, and I end up lusting after things that will give me the "perfect style." Especially since I'm just starting my blog, I'm feeling pressured to produce this amazing style that I just don't have yet in order to gain followers. I've been frantically buying stuff to achieve a more interesting style. Right now I have a huge wishlist for fall, and I wonder if I would still want all that stuff if I didn't spend so much time reading blogs. I also know what you mean about buying for a life you don't have. A couple months ago, I bought some clothes for going out and clubbing that I have yet to wear (part of the reason being that my boyfriend has been out of the country all summer, but still...). I constantly see cute dresses, but I'm tryng to be rational in my buying and realize that I don't have enough occasions for all the dresses I already own. I don't really have any advice or solutions to this problem, but I just wanted to let you know that you're not alone! I don't think you are a bad person but I think it is a problem when you buy something and don't know where to wear it too. I know you can let go of things. You can do it! Do a major purge! While blogging is a pleasure and way of expressing ourselves, I will be the first one to admit that I've sort of gotten carried away. I buy everything because it's on sale and adorable, but then touch it twice more and continue to buy "cute" things. I've been better lately as I forced myself to ONLY buy my "extra" goods at thrift stores, but the itch is always there to just BUY something new. It's a terrible addiction! The only thing we can do, I think, is absolutely FORCE ourselves not to shop online and to be inspired by what we already have. It's hard. It's SO hard. But I think it's doable :) We all need to remind ourselves that we blog and scour eachothers blogs because we love the creativity involved in making a new outfit, not the price tags or "newness" of them. I totally tried on that very same dress today and came really close to buying it. My sister talked me out of it since it wasn't an amazing dress, but more of a so-so one on me...and I have nowhere to wear it. Anyway, obviously I know exactly where you are coming from. I totally agree with Elaine that a closet purge is in order. It sounds like you're in the right place mentally to look at your wardrobe really critically. I think about these same thoughts ALL THE TIME. I think I may need to do a detox SOON. However, I don't think I could give it all up for a long period of time, shopping releases a lot of stress and allows me to express myself. PS. Since we live so close, we should definitely make a shopping date soon! 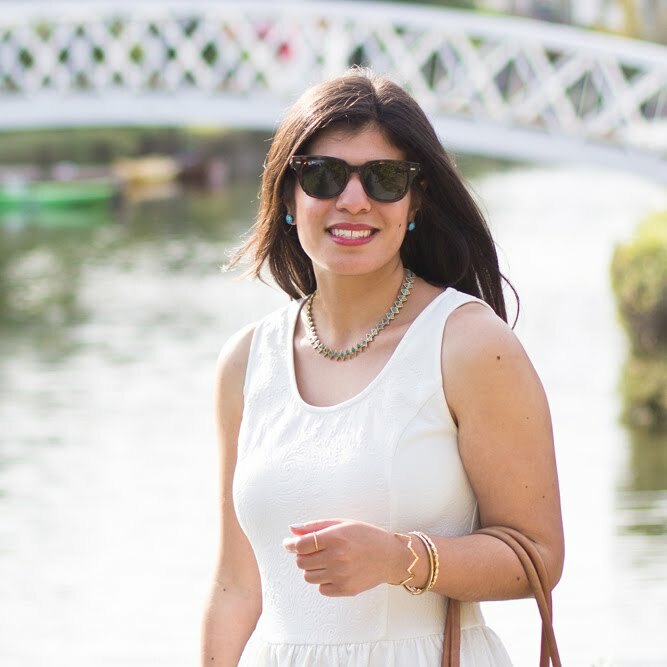 Enter my giveaway to win an OufiLondon handbag! i always think reallyyy hard before i buy something, did i really really need that? am i gonna wear it often? shopping not a bad thing, just keep your mind clear when u decide to buy something. i not really helping, sorry. I do understand what you mean. However, before I do any large amounts of buying, I always look at my closet and see what I already have - sometimes I try to come up with new combinations. Also, the lack of space stops me from buying too much, haha! I think you should buy things that you need and that make you happy, but don't overdo it. Take a break, and see *why* you think you need all the new stuff - maybe there's something else that's more fulfilling that you could do? When I've got the urge to do something I think I shouldn't, I go for a run outside, spend time with my family and friends, let myself have a day of pampering, etc. I hope that helps! Take care, gorgeous! I don't think there's anything wrong with buying something you like/want/need with money you've earned. I mean you don't feel guilty for buying foods you like, paying for traveling or paying bills. Buying clothes is just doing something you enjoy. I buy a lot of DVDs and could think well do I need them, I could wait for them to come on TV, but why should I if I want to buy them now with my own money. beautiful dress :) id wear it everywhere with added correct accesories and a good jackets for winter. I love shopping too, but I also have a budget to stick to (which I'm way over, haha) so no shopping for me this month :) and maybe even next! you can be my buddy in it if you want! It is so lovely to read all of those wonderful comments! I know what you mean...I think of my blog alot when I buy things too...I'm like "ooh this would be great for an outfit post!" Oh my, I definitely can commiserate. I've found that cutting down on my Modcloth, etc., visits is really helpful, and instead using that time to focus on blog growth or entering giveaways. I'm SO with you. Especially having a blog now, I get the feeling of "hey, even if I only wear that a few times, I can still showcase it on the blog as it's AWESOME"... It's kind of a bad thing. I do feel the guilt of buying, but then, at the same time, it's whatever makes you happy right? And I'm the biggest hoarder you will ever meet. WHO KNOWS WHAT WILL BE COOL IN A FEW YEARS. Me in Grade 8 had the (maybe) RIGHT IDEA. Hi from Bali! We are such enablers aren't we? I say if you can make a few outfits of them and/or it's both work and weekend friendly, go for it. p.s. I'm working on my blogroll finally. I thought you of my blogger chic on the cheap boddy and would be honored if I could be on your blogroll too! This is EXACTLY why I started the remix challenge! I feel like now that I read and participate in fashion blogs, I buy way more stuff than I used to. It's sort of overwhelming. I appreciate that you took time to address this. If nothing else...get those fabulous chiffon shorts! now i'll go stare down anthropologie. I did that this weekend -bought so many sale items it was more than the budget I'd set myself! I should add that you've won an award. Details on my blog. This really resonates with me, as it has for many others, it seems. It's such a weird feeling to look in my overflowing closet, KNOW that I need to get rid of so much stuff, and still think that I "need" a leopard print pencil skirt. There I've said it: I dream about leopard print pencil skirts every day. *Sigh* The thing is, of course I don't NEED it. No one NEEDS an item of clothing that specific, and I'm still living and breathing and healthy without it. It's hard to step away from the stuff just because it's so easy to rationalize and think, "I could do so much with it. It'll only cost three cents per wear!" Anyway, I'm trying to challenge myself to wear what I've got. Wear all of it. And if I can't wear it, I'm getting rid of it. Maybe there needs to some kind of virtual clothing swap to cut back on the consumerism while maintaining the freshness? Seriously, kudos to you for making a post like this; I can definitely relate. For years I just bought clothes after clothes after clothes that I hardly ever wore or felt comfortable in. I couldn't quite figure out why I had to shop so much, and it took a toll when I moved out on my own for awhile. I totally get his. Totally. I went on a shopping ban at the beginning of 2010. Lasted 6 months. I learned a LOT. I highly recommend it, maybe try a month. I found myself shopping for clothes to go shopping. Which made NO SENSE. I also did nothing but shop. I have a thing for cocktail dresses and would shop for those.... where the hell am I going with so many cocktail dresses??!! I think you have a great personal style - and I like seeing how you re-style items. I don't think that you need to buy more- but yes, it is tough to draw the line between need and want. oh yes I am loving the UO red shorts!! BTW- I feel like you stole these thoughts from my own head. I can't help you here. 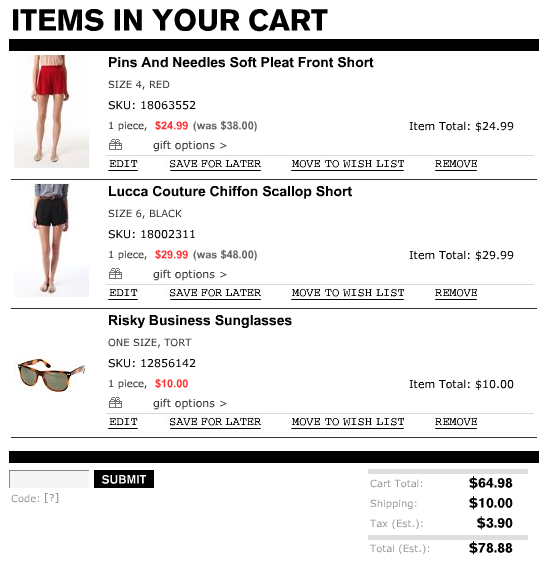 I adore those scalloped shorts, and 10 dollars is kind of a steal for classic sun glasses. I am clearly a bad influence. thanks for opening up so much on your blog! love that photo of the clothing rack. Well, I agree with many others that you have great personal style. I think it showcases your personality and you definitely have a unique look. That said, around the 4th month or so of style blogging, I realized that I wanted to buy more, and I'd justify it through the blog. And then when I said, "Just thrift", I found myself thrifting way more than I had space for. But I didn't want to purge! I am doing the Great American Apparel Diet, but I have a feeling that I may end up changing my style habits and maybe even my blog as a result. I want to have a comfortable, debt free life with strong savings, travel, fun experiences (and hopefully a relatively well-adjusted child, if I am so lucky) more than the latest trends and an envy worthy closet, although I do like reading about other's style and purchases. 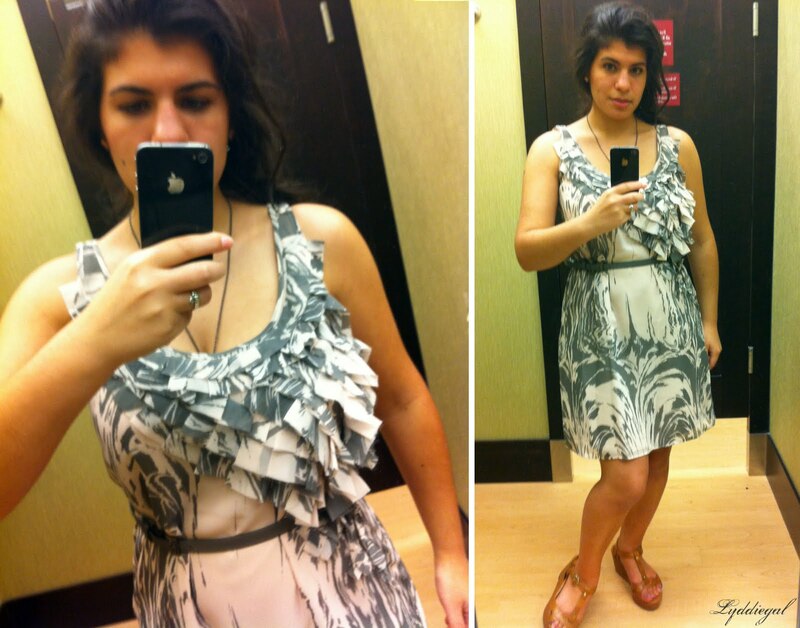 I want my own style to be divorced from making a lot of purchases, but I don't want to look boring, dull, or frumpy. It's a difficult line to navigate, and I hope to do so with accessories (which I've not really taken advantage of in the past). Why not try a shopping diet- where you limit your shopping to a set amount each month, or a shopping diary, where you keep track of what you were feeling when you went shopping? And take that list of things you'd like your life to be like, and cross something off the list! I really had this problem at first and then I just decided to get picky, to the point of being a clothes snob. And its worked! In any case, every other month or so, I put myself on restriction. That means absolutely NO SHOPPING for whatever timeframe I specify (usually two weeks to a month). It definitely helps. One good thing to note is that I've started thrifting and vintage shopping. I didn't do that before I started blogging, and it's definitely more budget-friendly.